The expansion tank is situated in the upper part of the cooling system and is usually made from polypropylene plastic (PP). If the cooling fluid heats up, it expands. To prevent the hoses between the radiator and the engine from becoming overloaded or even bursting, the displaced cooling fluid is accommodated in the expansion tank to minimise the loss of coolant. The excess pressure generated is reduced by means of a valve, which is built into the cap. When the temperature of the coolant returns to normal a negative pressure is generated in the cooling system. With the help of the equalisation valve in the cover, ambient air flows into the tank. This pressure equalisation function prevents consequential damage, for example, to the coolant hoses or seals. DT® brand expansion tanks have optimally processed adhesive joints, which ensure a particularly high pressure resistance and durability. The material and surface coating of the press-in bushings achieve a high level of corrosion resistance. The opening pressures of the valves correspond exactly to the original specifications of the vehicle manufacturers. The standardised electrical connections of the sensors are optimally sealed and therefore extremely resistant to coolants. 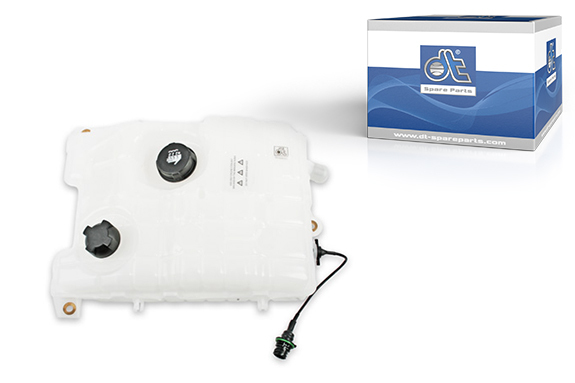 Due to the best possible construction and accuracy of fit, DT® Spare Parts expansion tanks are easy to install.